For the second time, the geographic regions of Optimist International are hosting parallel district conferences this year. 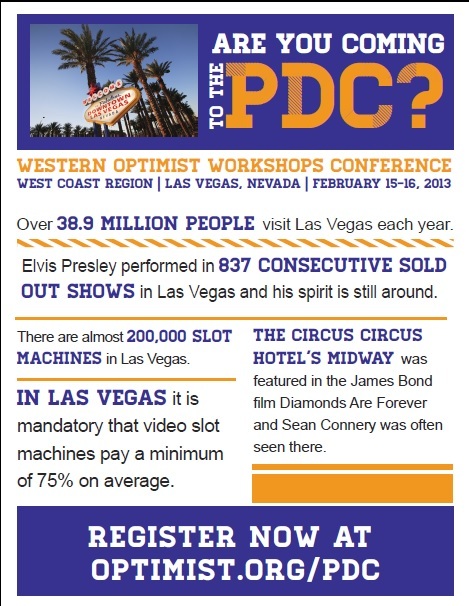 The West Region, made up of Alaska, Arizona, California, Hawaii, Idaho, Nevada, Oregon, Utah, Washington and British Columbia has scheduled its conference for February 15-16, 2013. The event will be held at Circus Circus in Las Vegas, Nevada. Every Optimist Club member is invited to attend this unique opportunity to meet Optimist International President J.C. St. Onge and to learn from some of Optimist International's most experienced trainers about how to make their Optimist Club more successful. Click to register for the WOW Conference here. Rooms at Circus Circus are $88.00 plus taxes and resort fees. Call 1-866-755-7776 ex 1 and use code CW02WOW to make your reservations. Governor Larry and Flo Blackburn will be attending the WOW Conference. Join them!